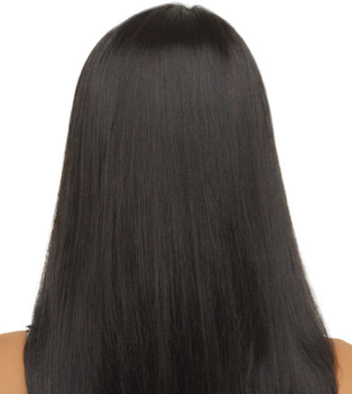 Hair is one of the most unique and personal mementos people can give of themselves. 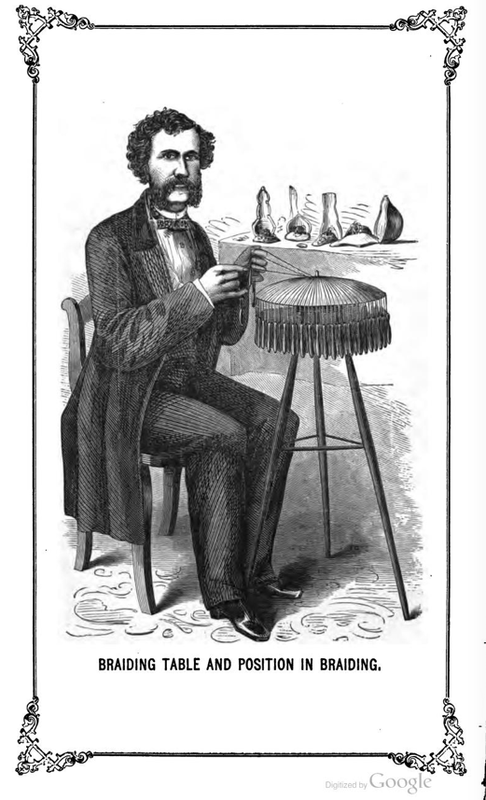 Although taking hair and weaving it into memorial pieces has been done for hundreds of years as a way to remember a loved one, it was the Victorians who took the idea and crafted it into an art form. 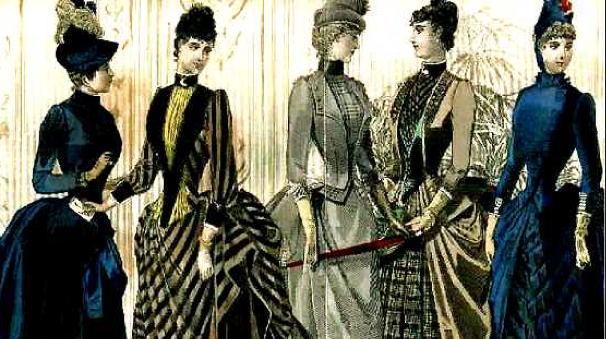 The Victorians had elaborate customs for any life event encountered; but this is one tradition that could take different shapes and forms. Hair jewelry allowed Victorians to carry a part of their loved ones with them in the form of bracelets, rings, brooches, watch fobs, even buttons: It was similar to putting a piece of hair in a locket. 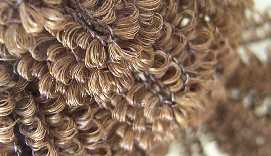 Hair from a deceased family member was usually made into a mourning wreath for remembrance. 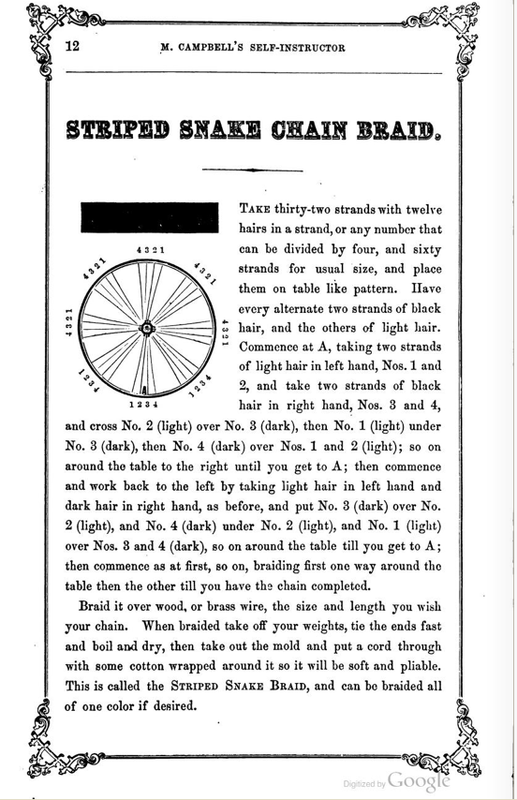 A mourning wreath could be made up of one member’s hair or a composite of an entire family. 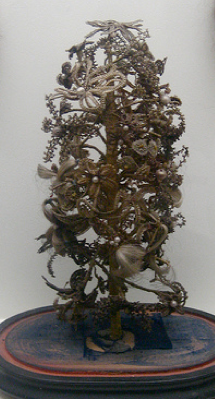 As family members died, hair was saved in a “hair receiver.” When enough was accumulated, the hair was fashioned into flowers and leaves by twisting and sewing it around shaped wire forms. 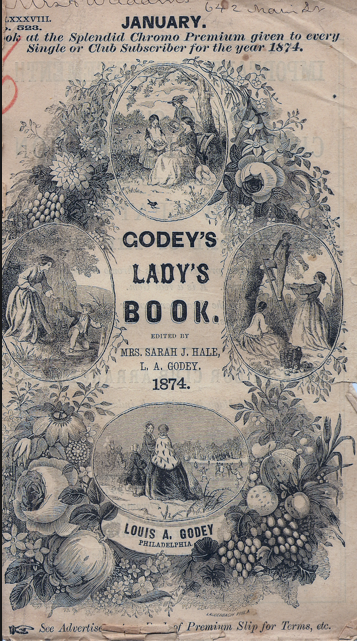 Godey’s Lady’s Book provided some patterns and advice on how to shape and create a hair wreath, but detailed works included the Self-Instructor in the Art of Hair Work published in 1867, and a catalog from the National Artistic Hairwork Company. 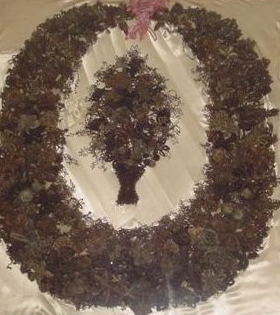 Shapes were then combined into a U-shaped wreath with the most recently deceased’s hair having a place of honor in the middle of the wreath. 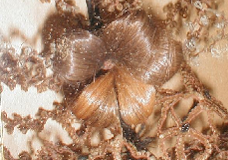 This is why wreaths may have a difference in hair colors and textures. 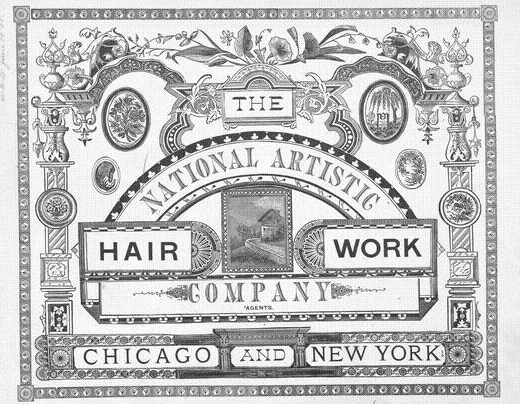 A family hair wreath was a way of telling about the family and its history; the same way a family tree indicates who members of a certain family are and their relationships, today. The open-end at the top of the wreath symbolized the deceased’s ascent to heaven. 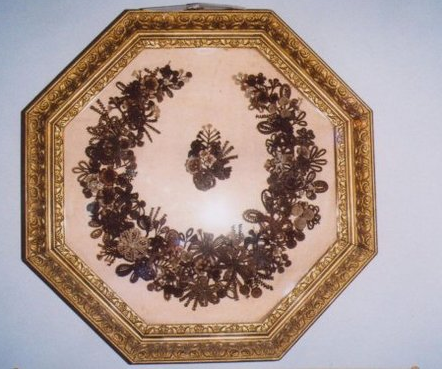 Wreaths were then placed in shadow boxes and displayed with the open end up, like a horseshoe. Not all hair wreaths were for mourning. Churches, schools and other groups might make a hair wreath from the current congregation or school. 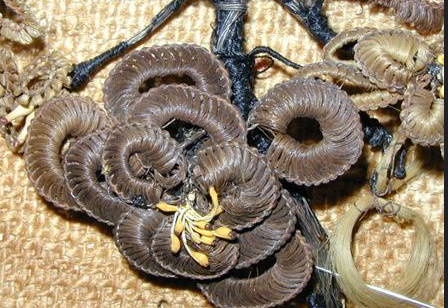 Everyone would contribute hair to be woven into the wreath shape. 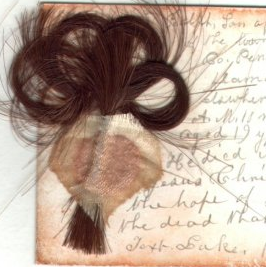 Hair could be made into small shapes and sent to families who lived far away as a memento of a recently deceased loved one. 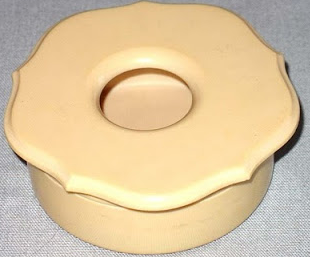 It also could be crafted into three-dimensional sculpture and covered with a glass dome to set upon a parlor table. 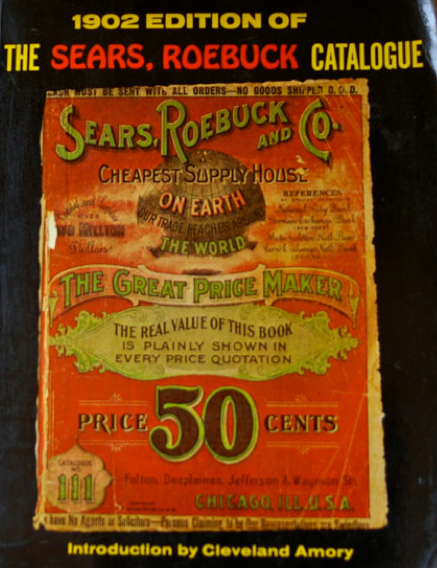 In the early 1900s hair jewelry could be purchased through Sears and Roebuck Catalog. 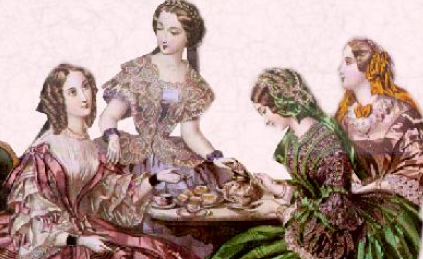 Today, hair wreaths can be found at auctions and estate sales. The value of hair wreaths continues to increase, with prices anywhere from a few hundred to several thousand dollars depending on the size and condition. In the small resort town of French Lick, Indiana there is a very unique museum: Body Reflections and Antique Hair Museum www.bodyreflectionsfrenchlick.com. 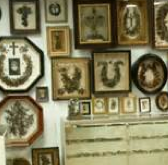 This collection of antique hair items, including hair wreaths, were collected by salon owner Tony Kendall who started displaying his collection of vintage razors, permanent-wave machines and hair art in his beauty salon - Body Reflections. 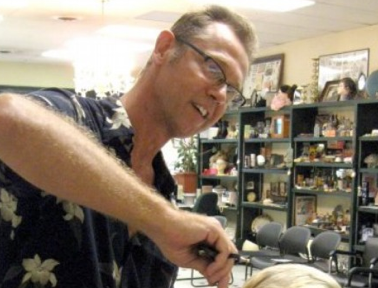 Leila’s Hair Museum www.leilashairmuseum.net in Independence, Missouri is the only official hair museum in the world. 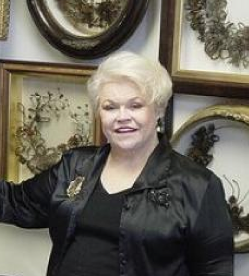 Owner Leila Cohoon, a hairdresser, bought her first piece in 1952, and that's how the collection began. 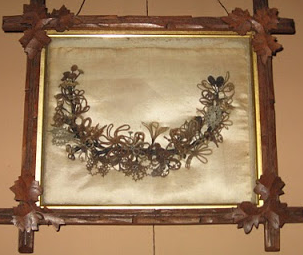 Today, the museum boasts of over 600 hair wreaths and over 2,000 pieces of jewelry, all crafted from hair. Regardless of how we view the art of mourning hair wreaths and hair jewelry today, it was a way for our ancestors to keep a piece of their loved ones close in an era when remembering was all that mattered because “You are never really gone, as long as you are remembered”.